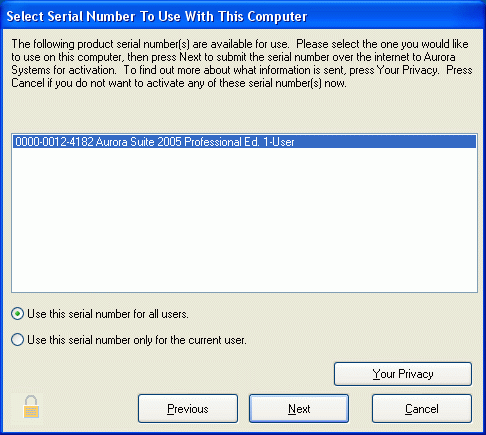 If you wish to activate the products you have purchased for full operation on the computer you have purchased them on, select the serial number for the product you wish to activate. Press this button to confirm your selection and submit the serial number over the internet to Aurora Systems for activation on this computer. Once the automatic activation has been processed, the process with continue with registration. For additional information, please see Registration. If you do not wish to activate the serial number automatically, press this button to leave the purchasing system without activating a serial number.